Will we ever get HMGs? Maybe it's just me, but it feels weird only having Light and Medium machine guns, when there are three 'weight' classes. I just keep thinking 'isn't there something bigger than Medium'. That would be the HMGs. Now, most will probably only know of the Browning 50 cal, but there are other HMGs. Basically, it's a weapon type that has bigger than rifle sized rounds, but smaller than autocannon rounds. I think the Germans had a 13.2 mm HMG, but it was only vehicle based. Don't know how that would work in BFV. Anyway, my point is, I'd love a slow firing, beast of a gun that caused massive damage to enemy players. Maybe completely remove hifire from them but allow 3x scopes. The ultimate area denial weapon! Of course, I don't blame Dice if they won't want to add such a weapon, becuase it'd compete directly with MMGs, but I just love the idea of wielding one of the most powerful infantry based weapons on all time! What is everyone else's thoughts? I think that would have to be mounted guns, like the Vickers mounted gun fortification. It wouldn't work as an infantry weapon though. I mentioned them in my suggestions I posted about 20 minutes ago, I thought the best way to implement HMGs was to use them as a customization option for half-tracks and tanks that you would need to unlock with assignments or something. Nope. Current MMG thing is a shlt show. People camping everywhere doing nothing, just waiting for someone to run by. IMO Dice should change everything back the way it was in every previous BF game where it worked perfectly. Ppl camp with every type of weapon. Some of us push the line forward with LMGs and take position when enemies are sighted. I gotta ask are you one of those that run out in open without cover and complain the games broken when everyone on the map fights over your death ticket? So you want MMGs to be a run and gun weapon? DICE is to blame for making them a weapon that can only be used like that. Idk if mmgs are entirely too blame for anything. Even before these mmg mechanics, i used bipods heavily with my lmgs. On bf4 i used bipoded m240B or RPK and in bf1 i switched around alot but always used suppression variants with bipod. So, at least for me, bf5 hasn't really done anything to change my natural playstyle. I like to keep my head low and support the movement of my team. Using bipods have always been a good way of doing this. How balanced would it be to have the MG-42 work the same as the LMGs? ADS while standing, 3x scope, 1,200 RPM rate of fire--it would be the only LMG anyone would use because it would shred anyone the user saw. So either they found a way to make this iconic weapon work in the this game, or they left it out. Which of those two options is preferable? Excuse me? 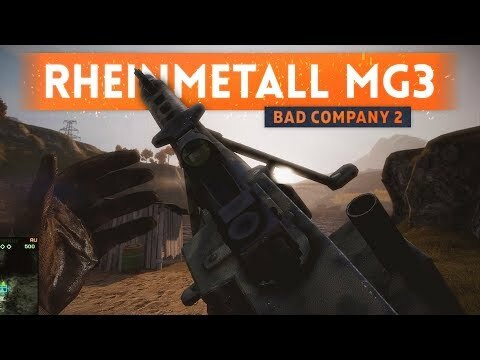 It worked in Bad Company 2, whats the problem now? Every modern weapon has a high ROF. In WW2, not so much. With great power, comes great responsibility. Now, if they could just stop Assualt DMRs from allowing you to hit shots while also dodging bullets like Neo from the matrix, that'd be great. Would be nice to see HMG nests where 2 players actually needed to operate with it. Maybe make them into gadget deployables? I don't think we'd ever use them as primaries. But his concept is really cool. You could deploy it, then pick it up when you need to move position. It'd be like playing with a real HMG. Yes more tools to promote camping/static play! Just what we need!